A Montreal UberX driver says he has filed an official complaint with police after he was egged early Wednesday morning during an attack he blames on the taxi industry. "I don't know from where the eggs came. I was scared," said the UberX driver, who requested CBC News to withhold his name because he fears for his safety. The driver said he got a call to pick up an UberX client named David in downtown Montreal. When he arrived, two men got in the car, saying they were on their way to the airport but had to stop at their hotel first to pick up their luggage. 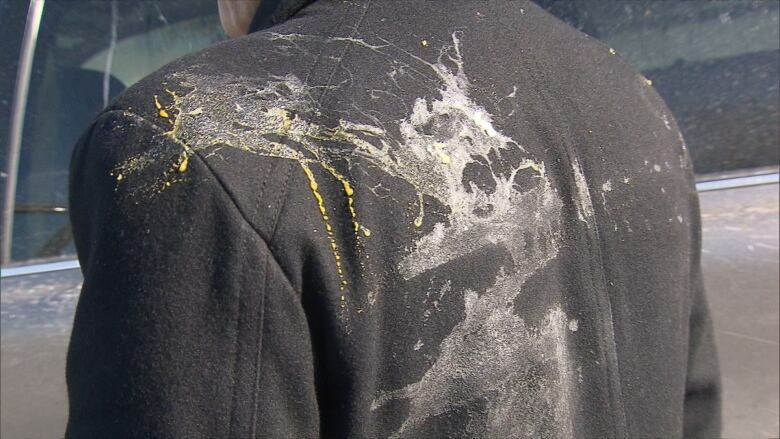 The UberX driver says he was ambushed with snowballs and raw eggs by taxi drivers during an anti-UberX protest. (CBC)"As soon as we arrived at the hotel … the two gentlemen rushed out of the car and suddenly, I didn't know where the eggs came from," the driver said, adding that a large crowd of people dressed in black suddenly surrounded his car. "[The eggs were] hitting the car and they tried to hit me," the driver said, adding that his car was covered in raw egg within seconds. "Inside the car, outside — everywhere." The driver said he believes the egg-wielding men were taxi drivers. "Some of them were very, very aggressive and outrageous. You can tell from the car how many eggs they bombarded me with." The man, who has been working as an UberX driver for the last four weeks, said he tried to get away quickly. "I was scared at the beginning, and I tried to move slowly because they tried to block my way, and slowly then I escaped," he said. "I'm new to the business.… It's unfortunate that they chose me do to whatever they did." The man, whose car was left covered in runny eggs and shells, said taxi drivers should be turning to the government to express their frustrations with unregulated ride-sharing services. "They don't have the right to stop you personally. They can go to different avenues. They can go to the government ... and the government can find a compromise," he said. For its part, Uber issued a statement condemning the "violence and intimidation tactics used today by members of the taxi industry." In an email, spokesman Jean-Christophe de Le Rue said the province "has put in place a commission to hear the views of stakeholders and we believe that the best path forward will be found through dialogue, not violence." The hearings on regulating UberX are set to begin Thursday morning at the National Assembly in Quebec City. Representatives from both UberX and the taxi industry are scheduled to make presentations.